Welcome to the children's ministry of Pell City First United Methodist. As Jesus welcomed all of the children to come to him, we invite and encourage all children to grow and experience the love of God, Jesus, and the Holy Spirit through their own unique worship, nurture, and service opportunities throughout the year. Click here for if you wish to join the Children's Ministry Facebook Group. We are a Safe Sanctuaries Church and take safety of our children and volunteers seriously. All volunteers are required to undergo a thorough federal and state background check repeated every three years and attend annual Safe Sanctuaries training and refreshers. Children are escorted from the 10:30 worship services to Children's Church in the Beacon's Garner Room. During this time, our children (3 year old-3rd grade) are nourished through relevant Bible teachings, music, discussions and age appropriate activities in an environment that associates Christianity with joy and love. Choir shapes a child's spiritual life by teaching theology through music. Our choir, with voices and hand bells, leads our congregation in worship regularly and offers opportunities to bless others in our community. They also host and perform an annual Christmas Pageant that brings hope and joy to many. We strive to bring life- and life change- into Bible lessons. Join us for a journey through the Bible learning God's truths through creative teaching, hands-on activities and real life applications. Each week our kids gather together to learn grow a little more rooted in their faith. This happens through music, teaching, crafts, games, and activities in our Wednesday Night Children's Small Groups. This is our 4th, 5th, and 6th grade ministry. Club 456 meets on the 3rd floor of the church on Wednesday Nights and Sunday Mornings. They also meet after 10:30 Worship on the 1st Sunday of every month for a fun group outing. 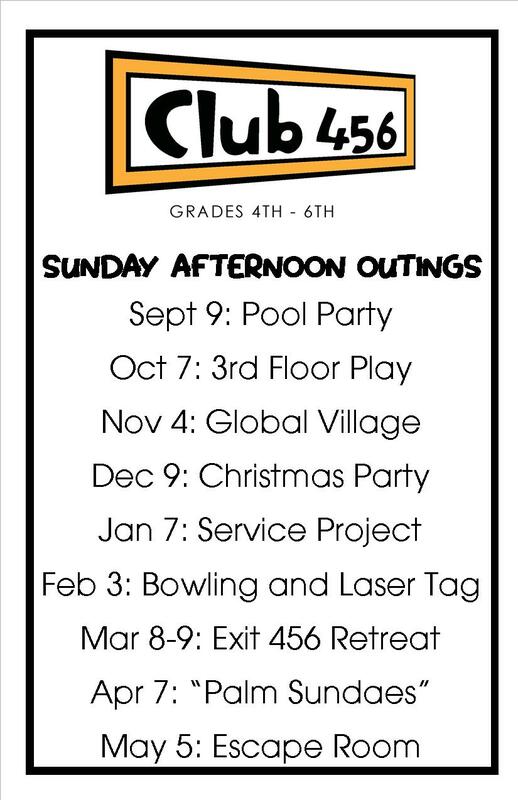 For a 456 Group Outing Schedule click here. Our children have many opportunities to be the hands and feet of Christ. As children grow spiritually, they need opportunities to serve others. We are always seeking direct involvement opportunities to instill the importance of helping others in Christ. They have made cards, knitted blankets, decorated gift bags they filled with toiletries and hand delivered them to the residents of the local Veterans Home. On Wednesday evenings during the school year, children can help pack nutritious snacks to feed those other children in need.